The first Booker’s bottling of 2019 is on its way, in honor of a longtime employee of the company. Teresa’s Batch is named for distillery employee Teresa Wittemer, hired three decades ago by renowned Master Distiller Booker Noe. 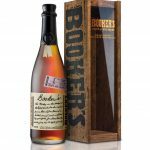 Her namesake Booker’s release is aged six years, three months, and one day, and is bottled at 125.9 proof. Each year, the distillery releases 4 batches of uncut, unfiltered Kentucky Straight Bourbon Whiskey in the tradition of their late Master Distiller. At Christmas, Booker would select prime barrels from the warmer center sections of the rock houses and bottle them without filtration or water added. He gifted these bottles to friends, family, and distillery employees, who now do the same for bourbon lovers around the country. Every release is named for a person, place, or thing Booker loved. Previous batches have included Kathleen’s Batch (named for Brand Ambassador Kathleen DiBenedetto), Dot’s Batch (honoring Booker’s loyal dog), and Kentucky Chew (an homage to his method of tasting whiskey). Booker’s Teresa’s Batch is on shelves now in limited quantities for around $80. The post First Booker’s Release of 2019 Named for a Whiskey Batching Legend appeared first on The Bourbon Review.